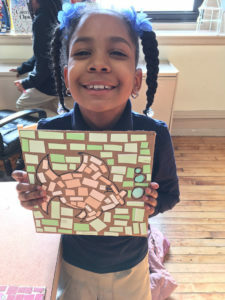 Using donated paint chips from the Chip Kit provided by Fresh Artists, and recycled cardboard from ESF’s Operations Center, students at the After-School Academy created Mosaic Masterpieces. With only a few other supplies needed (glue, chalk, Sharpie markers), students created mosaics that depicted fruits and vegetables, sports, flowers, fish, and more! Students learned to think outside the box to create a piece unlike any other!